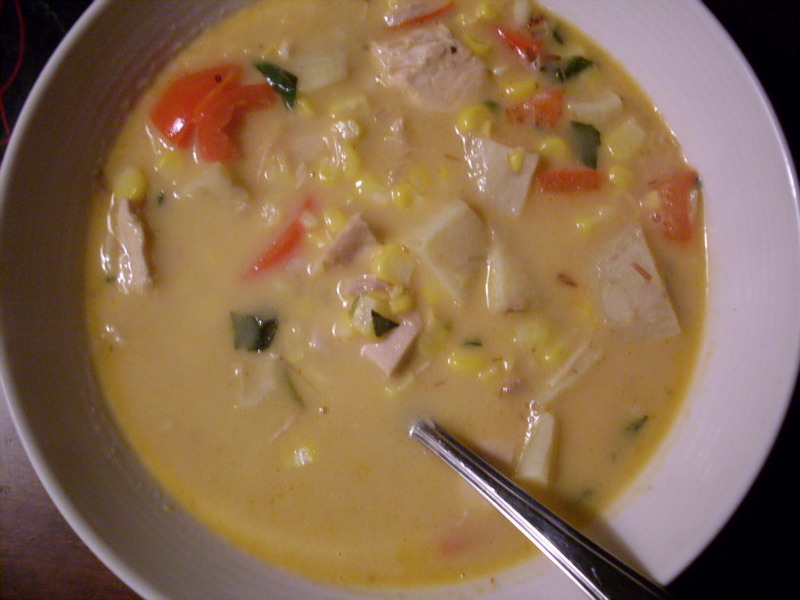 Coconut chicken corn chowder, and some pictures that do not do it justice. I have talked about food and its importance as a tool of expressing love and home, but I would be remiss if I forgot to mention in all that idyll that while I most certainly cook because it is the way in which I convey my awkward affection, I also do it because I want you to like me. Food is my way of bribing you to ignore the film of flour and cat hair that covers most of my apartment floor, or the weird jumble of things that might come out of my mouth when I mean to say something else but am tired and have had no caffeine today but three glasses of wine already. It’s how I welcome new friends, and how I hope to keep their attention, thus preventing it from wandering to the less-than-savoury elements of my home’s decor. And recently, though less recently than he will admit (and my badgering has been relentless, so he put up an admirable fight), Paul has found himself a girlfriend, whom he has kept secret from us, as if he doesn’t know full well that I like to know all the things. And when I finally shouted about it in a crowded restaurant this week, begging “Why, Paul? WHY? !” he broke down and offered to bring her to meet us. Mostly to meet me. I promised that we’d have chicken and corn chowder and that I’d wear real pants, not something in Spongebob-covered flannel. I want her to like me. When you want someone to like you, the best way is to create a feeling of warmth, and more often than not that should involve coconut milk. Cheese is also very good for buying anyone’s affection, but in this case I served it in a side dish (I should give you the biscuit recipe sometime), which still counts. 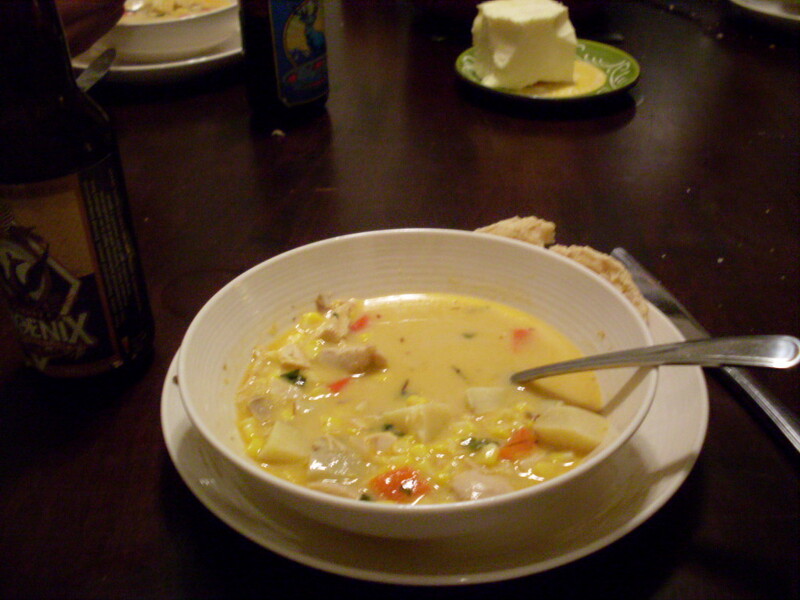 The recipe that follows is the sort of thing you’d serve if you were inviting someone new in, because it’s warm and comforting with its familiar elements, and because it’s also not what they’d expect when you tell them over the phone that you’re serving them chicken and corn chowder. Also, the name of the dish is a spectacular piece of alliteration, so bonus points for that. Heat oil in the bottom of a large, heavy-bottomed pot set over medium-high heat. Add ginger, shallot, garlic, and lemongrass and sauté quickly, until golden. Add sweet potatoes and one cup of corn. Add stock. Scrape the bottom of the pot with a wooden spoon to scrape off any browned bits. Add coconut milk. 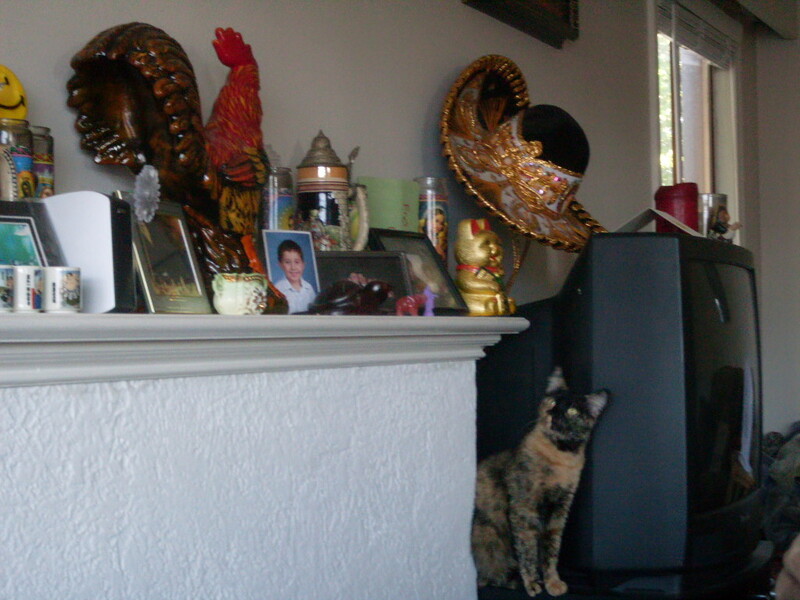 And then chicken. Add fish sauce, lime zest and juice, and sriracha. Bring to a gentle boil, then turn heat down a couple of notches, so that the pot returns to a simmer. Simmer for ten to 15 minutes, until sweet potatoes are fork-tender. Add remaining corn and the red pepper. Simmer for five minutes. Then stir in most of the basil, except for a little bit which you will sprinkle over top of it all at the end for colour. Taste. Adjust seasonings as needed. Inhale. Feel wonderful. Serve hot, with baking powder biscuits. Take better pictures than this. And then turn your attention to Paul’s new girlfriend, who happens to be quite lovely (and also likes cats), and make a mental note to remind him in the car on the way to Powell River this weekend that he ought to remember from now on that you will continue to like to know all the things. I hope she likes us. < Previous Stuffing ball soup. Next > A Clambush at Desolation Sound. This looks amazing. I have to make it, now. If it looks better than the pictures, that just makes it more amazing. I am going to make this sometime this weekend and pretend that I live close by enough to be eating it at your house, ignoring flour and cat hair and giggling at the PJs and wine-soaked witticisms. 🙂 How do you keep making things that, against all odds, crowd each other out of my dinner wish-list queue? How? !